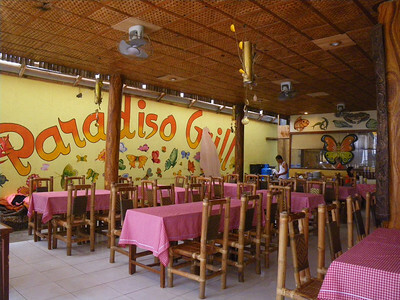 Paradiso Grill Restaurant in Boracay is a beachfront restaurant located at Station 1. 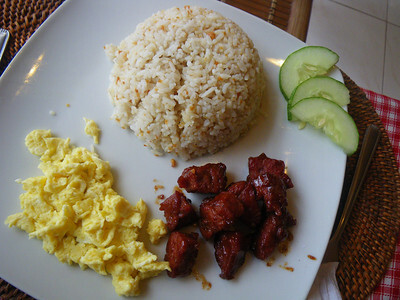 It's one of the many offering relatively affordable breakfast meals (at P80 per order) along the beach. Service can be quite slow (but then again, we were the first customers at around eight in the morning so they were really just cooking the fried rice). 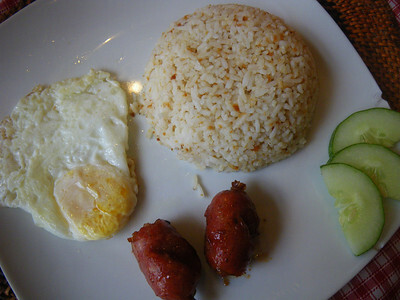 We ordered the tapsilog (pictured above with the pork cubes) which tasted both like tapa and tocino and the longsilog (pictured above, a must try because the sausage has that hint of beer which gives it a very distinct and unique taste). 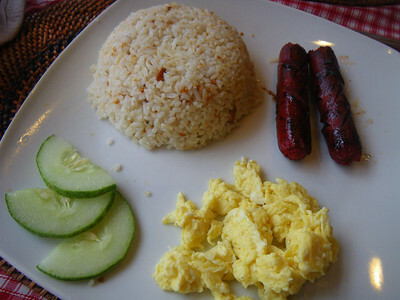 We also ordered hotsilog but had to return the dish because the hotdog tasted a little sour (usual problem with hot dogs that were not defrosted or refrigerated right). The staff duly apologized and replaced the order with something else we preferred (they offered to cook hot dogs again but we were scared the whole batch would taste the same). What's more, they asked whether our son has ingested some of the hot dog which we really appreciated because it showed awareness and concern. So yeah, i'd say the service is commendable. And the rice serving is just really huge! We couldn't finish our own plates, let alone our son's. During regular dining hours, the restaurant offers seafood fare.